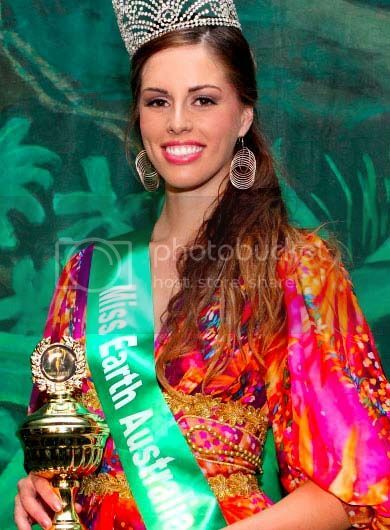 Notes: Deedee Zibara was crowned Miss Earth Australia 2011 last November 4. I hope to incorporate solar, wind and water powered transport and business operations into a global constitution, where it is mandatory for all countries to power their everyday transport and business operations by sustainable energy rather than carbon emitting fossil fuels. Using sustainable energies will ensure our children and children’s children their welfare, safety and longevity during their lifetime. Australia’s robust economy is a strong representation of our triumph of excellence. The implementation of our recent Carbon Tax demonstrates Australia’s forewarding thinking and concern for the environment. I am proud to come from a country that is democratic and that considers what is best for its people and best for its home. Australia is blessed with the most beautiful beaches and way of life. I will promote my country top to toe each day, as I am supported by Australian made and owned Swimwear, Gym wear, Makeup, Skincare and Accessories. I can promote the most prominent issues in Australia at the moment such as the Great Barrier Reef situation and the Carbon Tax. I wish to promote the amazing tourist attractions available in Australia – we have so much to offer and all of these destinations have something so diverse on offer. I was very blessed to have a large family. Although there were hard days, my family has grown very strong and close. I remember large family barbeques on Sunday afternoons, and birthday dinners galore. I was a very happy, enthusiastic child and insisted on doing every extra-curricular activity I could. I would do Tae Kwon Do 3 days a week, play regular Netball competitions every Saturday, have State Representative Netball carnivals on Sundays and fitness training every other day of the week! Plus I loved school with a passion and excelled in my academic studies. Thank goodness I had such supportive parents or I wouldn’t have the drive I do today to succeed. That anything is possible – you just want to have to do it enough. My Mum and Dad used to laugh because everyday I would want to be something different – a Psychologist one day, an actress the next and a Ballerina at one point too!! But what I learnt is that everything is worth trying and you should never underestimate the power of one human – or what the human race can achieve together for that matter. That would have to be the day my parents separated. While it was a sad time at the time, it has been a blessing in disguise and many lessons have been learnt from this experience. One is that life does not always turn out as we expected. Two, is that everything happens for a reason. Three, is that we can change our own destiny at any point in our lives. My family is happier and stronger than ever, and we still are altogether for numerous family occasions. We are all blessed to be happy and healthy. I have many environmental advocacies. I am first supporting carbon caps, and initiatives by governments like Australia’s Carbon Tax. Secondly I am promoting awareness about World Heritage Areas in Australia’s state of Queensland. Deforestation, fossil-fuel energy expenditure, food waste, land infill, pollution of our waters, endangered species are also other topics I feel passionate about.